Due to Transport of Dangerous Goods regulations any one shipment is limited to 1kg (3 jars) maximum of salt. Orders containing salt may not ship via air. 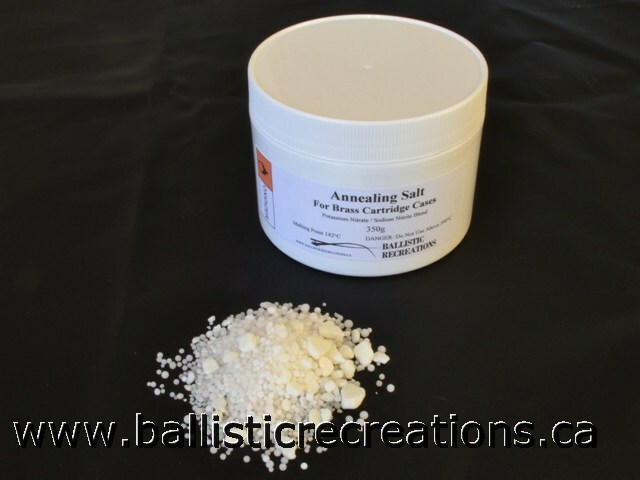 Predominately a blend of potassium nitrate and sodium nitrite, this salt closely matches the old MIL-S-10699 Type I heat treating salt used by US government armouries for heat treating metals including copper alloys. Ideal for annealing and stress relieving of cold worked brass cartridge cases, the salt melts at 142°C and can be used up to 590°C. Will not affect your brass cases, and is not overly corrosive to the steel pot of the Lee Precision Melter. The salt may be heated and reheated indefinitely. You will lose small amounts due to “drag out”, the tendency of a film of salt to cling to cases and tools that touch the bath, making it necessary to occasionally top up the pot. Assuming you are starting with a full pot of salt, one 325g jar is sufficient to top up through 3,000 to 5,000 medium-sized rifle cases. 325g packed in a moisture-resistant jar. NOTE: If heated above 590°C this salt will begin to decompose, releasing hazardous nitrogen oxide fumes . At higher temperatures the salt becomes a powerful oxidizer that may cause spontaneous and violent ignition of flammable materials including wood, wax, oil, plastics, and light metals. Use only in a well ventilated area. If at any point in your annealing session the pot begins to make a sound like a boiling kettle, emits visible fumes, or the salt begins to develop a yellow colour you are running the pot too hot. I do not recommend using this salt without a temperature measurement device that is known to be accurate in the range of 300°-600°C.